If you’ve just turned on your Apple Macintosh SE/30 after it’s been put away for the last few years in storage and found there is no sound from the speaker…and trying obvious things like turning up the volume at the control panel doesn’t work, then chances are the main board is suffering from leaky capacitors. These and other start up problems such as sad Mac and checker board screen are frequently caused by leaking SMD electrolytic capacitors. Fortunately this can be fixed, but you’ll need to brush up on your soldering skills. It’s no secret, that surface mount capacitors on old Macintosh’s go leaky and lose their capacitive value over time. Worse still, these leaking capacitors have a really nasty habit of releasing corrosive goo which eats away at the tracks on the PCB, creating more havoc. In a worse case scenario, the PCB may have suffered terminal damage, with tracks and other components severely damaged surrounding the area of the leaky capacitors. Many of the Mac models from the late 1980′s and early 1990′s such as Mac II’s, Classic, Classic II, Color Classic, IIcx, IIvx, IIsi, etc use similar aluminum surface mount capacitors and are prone this problem. The SE/30 is no exception, with several critical SM capacitors being located around the SE/30′s sound circuitry. The first sign of leaky capacitors on a SE/30 is a loss of sound and screen problems at start up, such a checkerboard screen pattern, horizontal lines and other unpleasant patterns. Many of these problems are caused by C3 (47uf), C4 (47uf), C5 (47uf), C6 (1uf), and C7 (47uf)…. and replacing these nearly always fixes the (lack of) sound problem. There’s nothing special about the original Surface Mount (SM) capacitors, other than their compact design, and probably suited Apple’s manufacturing process at the time. They can be readily substituted with regular radial lead electrolytic capacitors which work just fine. This is a true and tried technique Mac repairers have been using for years. Whilst it’s probably not the most neatest and elegant fix, it’s pretty easy to replace these capacitors and certainly eliminates those old leaky SM capacitors eat away at your precious Mac SE30 motherboard. These standard PCB mount electrolytic capacitors work just fine as replacements. There are 10 x 47uf (16v)and 1 x 1uf (50v) surface mount capacitors on the SE30 mainboard. Each of these can be replaced by standard electrolytics. 1. Removing the Mac SE30 motherboard from the case. Assuming you’ve gotten the back cover off the SE30, you can go about unplugging the hard drive SCSI cable, floppy cable, analogue board power cable and any cards in the PDS slot. Remove the floppy cable and logic-to-analogue board cable. Note the locking tab on this cable that needs to be pressed down and pulled to remove it. Remove the hard drive and carrier for easier access. Next, gently pull the whole board upwards so the slots in the PCB line up with the corresponding slots on the metal PCB mounting. From here, you can swing the board outwards and then disconnect the sound cable. The board should be free now. …and disconnect the speaker cable. 2. Remove RAM, ROM SIMM and battery. Before, doing repairs on the SE30 motherboard, make sure you remove all the RAM, the ROM SIMM and PRAM battery. 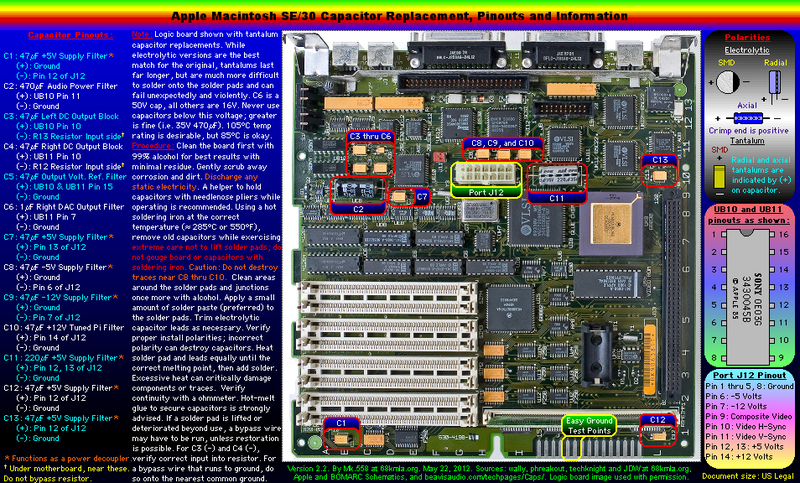 The biggest risk in removing the surface mount capacitors from the SE/30 board is damaging the original solder pads on the motherboard. If this is damaged you’ll have very little to solder the new electrolytic capacitor to… which can mean tracing the PCB track back to the next biggest thing to solder onto… arrgh! You don’t want that to happen…believe me. 3a. Perfect your technique first on an old CDROM circuit board. If you’re a little rusty with your soldering and PCB skills, I highly recommend practicing on an old circuit board first. It so happens, that many CDROM drives use similar SM capacitors and these are great for perfecting your capacitor replacement technique. This old CDROM drive has surface mount capacitors similar to the SE30 logic board. These are great for getting your technique right before tackling the real thing. I’ve found using a pair of pointy pliers and then twisting the capacitor gently in an anticlockwise direction is the quickest and safest way to remove SM capacitors from a SE30 motherboard. Usually the capacitor comes off fairly cleanly due to the legs already being partially corroded. All then is needed is desoldering the old legs from the solder pad and clean it up. De soldering wick or braid does a great job. Practice twisting off surface mount capacitors on a CDROM board…. …then do the real thing on the Mac SE30 board. Getting a grip on the surface mount capacitor with pointy pliers. Twist the capacitor around, till it breaks free. Be careful not to rip the solder pad off. The surface mount capacitor comes away cleanly without damage to the solder pad. Capacitors successfully removed. Legs and old solder still remaining. Once you’ve dispensed with those old leaky capacitors, it’s time to clean up the remaining legs from the solder pads and wipe away any of the corrosive leakage left of the board. I use desoldering wick for removing the left over legs and sucking up any remaining old solder and I’ve found using a soft cloth dipped in methylated spirits works well for cleaning off the capacitor residue. You can also use acetone and various forms of dry cleaning fluid (trichloroethylene) such as the stuff you get at the auto parts store for cleaning disk brakes. You can probably squirt down the whole board with this stuff…in a well ventilated area of course. Using desoldering wick to remove old capacitor legs and excess solder. Clean with methylated spirits afterward. Repeat this process a few times until the solder pads are bright and clean, particularly if there is a lot of corrosion. Solder pads cleaned up and ready. 6. Preparing Electrolytics for Soldering. You’ll need to get some 47uf and 1uf capacitors, trim the legs shorter and put a “foot” on the end of the lead. Next, put a blob of solder on each foot. Blob of solder on the foot of the capacitor. Begin with blobbing a small amount of solder onto each solder pad. Take note of polarity of the electrolytic capacitor, – and + leads. The SE30 motherboard has “+” symbol stencilled on the board indicating the the correct polarity, which is very helpful. Place the caps foot onto the solder pad and then apply some heat with the soldering iron till the solder flows nicely. Capacitor soldered on. Electro Caps are polarized so make sure you solder them on the right way around. Check the + symbol on the board. Do one lead at time: Make a temporary joint on one lead – If you blob some solder onto only one pad, then solder the cap on, you can use this as a way of temporarily holding the capacitor in place whilst you solder the other foot to the solder pad with fresh solder. Once that joint has been done you can complete the other foot. This method gives a slightly better result and saves a bit of time I’ve found. Once you’ve completed soldering on the new capacitors, it’s wise to double check you’ve soldered on the capacitors the right way around. You may also want seriously think about using some hot melt glue to secure the capacitors so they don’t wobble about and break the joint over time. Check jd_wages pic of this (link at bottom). Replace the board into the metal frame and reconnect the analogue board cable and the floppy cable. It should be now ready to turn on. Power up the Mac, and (fingers crossed), you should now get the familiar Mac SE/30 startup chime and a screen without any startup problems. Improvement of the above method by bending over all capacitors t0 secure them. Replacing old capacitors with SMD tantalum capacitors. Cleaning the ROM SIMM and sockets, cleaning RAM & sockets, re-seating chips. PC-Restorer.com is still in beta construction.